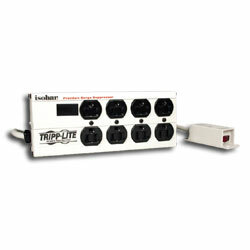 Tripp Lite's 8 AC Outlet Surge Suppressor with Remote On/Off Switch has a Unique mountable remote switch at the end of a 9 foot cord allowing convenient power switching of desktop computers and peripherals without reaching under desks or workbenches. Robust surge suppression with sine-wave tracking protects against the heaviest of surge conditions, exceeding IEEE category A&B specifications and reducing 6,000V test surges to harmless levels less than 35 volts. Multi-component suppression circuits combine torroidal chokes, ferrite rod-core inductors, HF/VHF capacitors and multiple layers of metal oxide varistors into exclusive isolated filter banks that remove EMI/RFI interference, even noise from other pieces of connected equipment.